online available now in any shop like amazon or rippletunes or qobus etc. JOPO & Ingeborg Poffet, two Avantgarde-musicians, who are international playing as Duo fatale, have already went several times to Bombay during their Asia-travels. Here, in the house of Shejwal, they studied the traditional north-indian hindustani-music and the language of the pakhavaj. In 1991 they founded the group JAISH. The first year they still played and lived together with Pt. Arjun Shejwal, one of the last great masters of the pakhavaj, who died in 1992. To his son Prakash Shejwal he gave his love to the music, tradition and deeply expressions. Like him Prakash is openminded for influences and combinations with other rhythm-constellations, New Music and Jazz. At the end of the second stay they documented their work as the trio JAISH (JOPO, Ingeborg & Prakash) with a recording in Bombay, which is published as music-cassette "mumbai-dance" (XOPF-Records no. 018). In '93 that trio JAISH played at the 2. int. XOPF-Festival '93 in Basel, Switzerland, followed by other concerts and a tour in april '94. In january '98 tempel-concert at the Gharana-Festival of Pakhavaj in Bombay with a great success. After that they did a working progress on new compositions with the sitar-player Atul Keskar with recordings in Pune. In 1999 they worked out a new program with the bansouri player Milind Sheorey, who is now the regular fourth member of JAISH. They have made a home-recoring in Bombay to document the new work. Interesting in that experiment of JAISH is the communication between the two cultures with the compositions of JOPO & Ingeborg. Having roots in both traditions, the improvisations are very important. 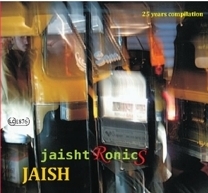 In 2006 JOPO & Ingeborg Poffet have created a new program for "Jaish'n electronics", which they have recorded in Studio Platinum in Bombay, India, for their new cd "jaishtRonicS" with further recordings & mixings in France and Switzerland in 2008 and 2014 including the new member Udai Mazumdar (side-man of Ravi Shankar) on tabla. The genesis and evolution of pakhawaj are shrouded in the mists of antiquity. By all accounts, it is considered to be the most ancient of the Indian percussion instruments. It has been a highly developed percussion instrument since time immemorial. The accuracy of its pitch and the variety of its tone have no parallel anywhere in the wider sphere of world percussion music. The instrument has been equally popular since ancient times in the Carnatic tradition, where it is known as mridangam. Pakhawaj is cylindrical in shape and hollowed out of a block of wood. The two sides have skin covers which are tightly stretched over both the openings and are fastened to leather hoops which, in turn, are held fast by interlaced leather braces passing along the length of pakhawaj. Cylindrical blocks of wood are inserted between the braces and the wall of pakhawaj. These help to alter the pitch as and when required. The left side is covered with a mixture of flour and water, like plaster, to add to the resonance in playing. It generates a full, bass sound. The central portion on the right side carries a permanent application of a black substance made from a mixture of boiled rice, manganese dust, iron fillings, and the like. This lends the instrument its typical tone. Pakhawaj was immensely popular during the Moghul period, when it was used as an accompaniment to vocal music, as also with instruments like been (veena), rabab and surbahar. It was, in fact, an inseparable accompaniment in the renditions of austere classical compositions like dhrupad, dhamar and sadra, which enjoyed tremendous vogue in the middle ages. Although, over the last few decades pakhawaj has been gradually going out of fashion in keeping with the waning popularity of the old styles of vocal and instrumental music, it is undeniable that in point of sheer subtlety and complexity, it continues to enjoy its ancient pre-eminence, both as a solo and as an accompanying instrument. This disc reveals how, at the hands of master-players, pakhawaj can weave hundreds of subtle and graceful patterns of rhythm in thrilling manner. Ingeborg Poffet started early to play several instruments and to sing. She had the first concert at the age of four with the accordeon. Later she played classical and contemporary concerts in orchestras and as a free lancer. From '84-'86 she studied computer-music at the Musikhochschule Cologne (Germany). JOPO & Ingeborg founded the "Duo fatale" in 1989. In their exciting formation they got a symbiose of composition, interpretation and improvisation. Living in Basel, Switzerland, they are both composers for all their groups and for command works as for theatre and multi-media-performances. They use to meet local musicians on their tours all over the world as in Turkey, Russia, New York, Indonesia, Germany, Sudan and Egypt. With Duo fatale they had concert-participations at int. festivals in Basel, Cheboksary, St. Petersburgh, Vilnius, Riga, Tallinn, Pärnu, Minster, Sevilla Expo '92, Singapore, Grenoble, Jakarta and Khartoum. Published releases with Duo fatale on XOPF-Records are "Fatalos" CD (no.5), "Fatalos 2" CD (no.11) and "living in Apollon's garden" from Duo fatale and the Duo fatale Orchestra CD (no.23). from Jabalpur (Madhya Pradesh) learned the bansouri (bamboo-flute) by the guru late Pandit Prabharar Bagaddeo and "Padmabhushan" Shrimati Annapurna Devi of Maihar Gharana. He was awarded with the national scholarship for classical hindustani-music '93-'95. He played with classical musicians as Ashwini Bhide, Pandit Birju Maharaj, Ajay Pohankar and others. Also his musical work is settled in Bhajans, Ghazals and Haveli sangeet as well as in film music and solo-concerts. Since 1987 he's working as a professional musician in Mumbai. He has worked with Prakash Shelty in "Hard notes loose change", a fusion album 1994-95 for the label "crescendo music". He did many recordings and releases on different labels as a side-musician with concerts in abroad like Paris and Amsterdam; his solo-concerts took part on festivals in Mumbai, Bangalore, Hyderabad, Bhopal and Pune. Since 1994 he playes regulary with Prakash Shejwal even for international concerts. from Bombay learned pakhavaj from his father and guru late Pandit Arjun Shejwal. In the music-competition for percussion in Bombay he got the first prize in '76, and in '83 he received the Gold Medal at the competition held by the All India Radio, and has now established himself as an "A"-graded artist of the All India Radio and India Television Programs. He plays as a soloist as well as an accompanist for great musicians like late Pt. K.G. Ginde, Dr. Bhat, Pt. K.Kumar, Pt. Siyaram Tiwari,Pandit Jasraj, the Dagar-brothers and Vishwanath Ramshes at the Tanzen Teagraja Festival in New Delhi '96. In Europe he has played with his father late Pt. 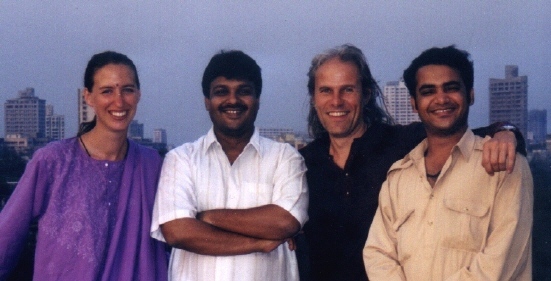 Arjun Shejwal ('90), Shrimati Shruti Sadolika ('91, ´92, 2004), Shujat Khan ('92), Ashwini Bhide ('95, with the swiss group hati-hati ('93) and the american vocalist Lisa Sokolov '92 (CD XOPF no. 17). In Switzerland he also took part at the bamboo-project '92 and at the XOPF-Pool-International '93 (MC XOPF no. 20) and at the XOPF-Pool-International '97 (Basel).He has also played along with the western groups which had their concerts all over Europe and received a great degree of appreciation from the audience there. 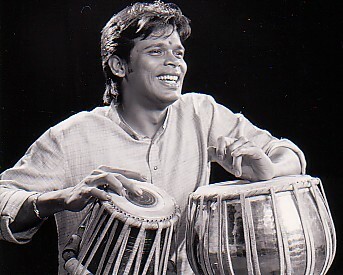 Udai Mazumdar (Basel/Delhi)is a tabla player of the Benares Gharana. He learnt from late Ashoutosh Bhattacharya, and the world-renowned sitar Maestro Ravi Shankar, Udai has participated in many Indian and international festivals and recorded several CDs, besides playing for and with Pt Ravi Shankar on different occasions. Udai is based in New Delhi and Basel, from where he travels for his concerts and teaches students privately at home in the age old traditional way of Indian classical music.